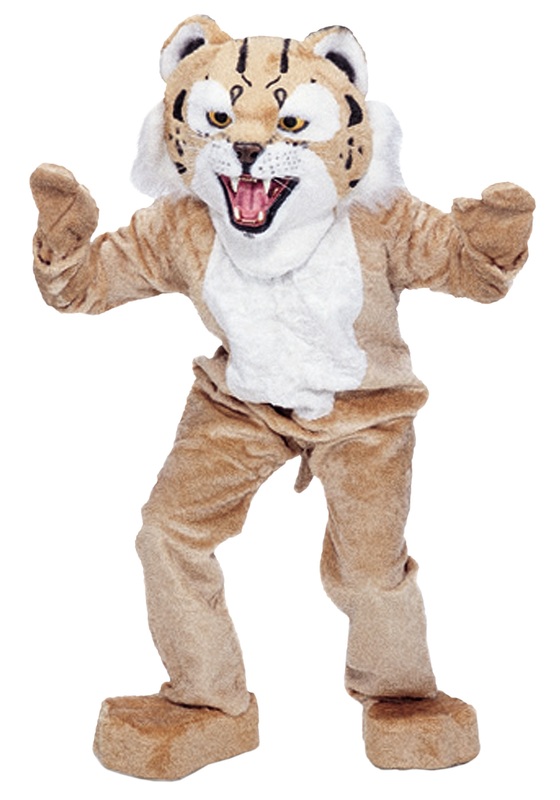 Share your school spirit with everyone when you wear this awesome wildcat mascot costume! This costume comes complete with a jumbo mascot head, plush body suit, mitts, spats and feet. The over-sized mascot head has tan fur with black stripes. The neck and eyes are outlined with white fur and the insides of the ears are black fur. This wildcat has yellow foam eyes with a brown foam nose. The tongue, teeth and outer part of the mouth are also foam. There is a black netting inside the mouth to see and breath out of. The head is held in place with a white strap that buckles under the chin. Included is the full sized body suit that is tan fur with a large white fur belly and zips up the back. To complete the costume, tan fur spats, mitts and over-sized parade feet are included. Both the spats and feet stay in place with elastic bands. You'll be the most spirited mascot in town!